I am so proud to be taking part of the new Power Your Lunchbox Pledge by Produce for Kids®, launchingAugust 11 and running through September 15, encourages parents to pack healthier lunchboxes for their kids this back-to-school season. Visitors to poweryourlunchbox.com can pledge to pack healthier lunchboxes; get RD-approved, kid-friendly lunchbox ideas and tips; and download coupons from companies supporting the program. For every pledge that families or individuals take, participating produce companies will make a 25 cent donation to DonorsChoose.org to fund health and wellness classroom projects around the country. Additionally, Define Bottle will be providing DonorsChoose.org with 20 percent of each sale during the pledge time frame. Produce for Kids’ Instagram and Twitter fans can use the #PowerYourLunchbox hashtag to show off their healthy lunchboxes throughout the program to be automatically entered to win weekly prizes and have their lunchboxes featured on Produce for Kids’ Facebook page. Prizes include bento boxes, fruit-infusing water bottles, grocery store gift cards and more. 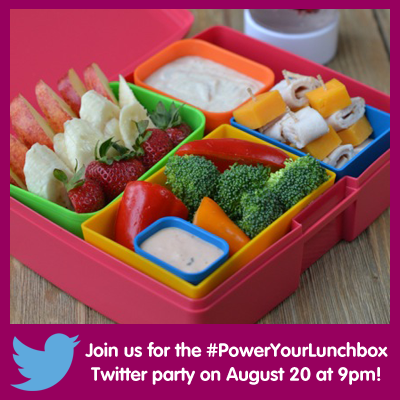 Parents looking for even more tips and resources for healthy lunchboxes are invited to join Produce for Kids and partner companies at the #PowerYourLunchbox Twitter party on August 20, 2014 at 9 pm ET. Produce for Kids partners supporting Power Your Lunchbox Pledge include: AMC Direct South African Summer Citrus, Define Bottles™, GROW by Organics Unlimited, Laptop Lunches® Bento-ware and Pero Family Farms®. These companies will be making a difference by helping Produce for Kids fund health and wellness classroom projects across the U.S. through DonorsChoose.org. DonorsChoose.org is an online charity aimed at helping public and charter schoolteachers across America obtain the supplies needed for their classrooms. To date, 190,000 public and charter schoolteachers have used DonorsChoose.org to secure $247 million in books, art supplies, technology and other resources to enhance student learning. Teachers across the country are encouraged to begin uploading their health and nutrition-based classroom projects as early as September 1 to receive funding from the Power Your Lunchbox Pledge program. Produce for Kids will be enlisting the help of the public to match donations to all projects that meet these requirements. For more information on teacher eligibility, please visit DonorsChoose.org. For more information, please visit poweryourlunchbox.com.